Download the latest Ford EcoSport brochure and specifications document as well as get the latest pricing for this vehicle. The Ford Ecosport’s safety features do more than just protect you, they help prevent the need for protection in the first place. Ford Ecosport allows you to drive with extra confidence knowing that it features a full 5 star ANCAP safety rating. Ford Ecosport comes with seven airbags, these include driver and front passenger, driver’s knee, front side and side-curtain airbags. 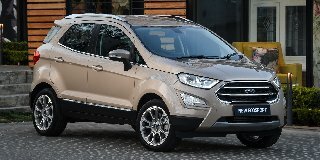 The Ford Ecosport comes in two palette colours for the different models, Ambiente models comes in 4 colours, Blue Lighting, Diamond White, Moondust Silver and Smoke. Titanium model comes in Blue Lighting, Frozen White, Magnetic, Moondust Silver, Ruby Red and Silk. Metallic body colours are options at extra cost.